One of the biggest problems with diseases during the first half of the nineteenth century was the focus on symptoms, and not knowing the difference between symptoms and disease. Doctors relied mostly upon symptoms to diagnose whatever ailed the body, leading to make some clinical decisions for treatments that weren’t always the best. This behavior is even more evident in the profession once the geographical theories for disease prevailed. The geography of symptoms in terms or where you lived was used to formulate many of the hypothesis upon which the diseases were based. This removed the causal thinking that blamed the individual for his/her illness. When nature was to blame, your next response was to eliminate that problem with nature, such as buying woolen clothing to avoid the cold out there or to stay inside away from the wind when it blew in the wrong direction. You have to keep your house dry for the most part to stay healthy, and when such a task was impossible and the air seemed “heavy” according to your senses, ventilation was required to prevent that air from becoming too stagnant in your place. Your food, your sleeping habits, your exercises, your drinking were all factors that helped contribute to the likelihood that nature would cast upon you the final blow to your health, and when such a fate made its way into your life your doctor was there to tell you if you should stay around, or move somewhere else to avoid the miasm influencing you so much locally. Canstatt’s work focused on the miasma theory, and every bit of nature that could be interpreted as representing some form of germ, particle or virus of this kind of energy or substance in nature. This reading is important because of how well Canstatt pulled all the natural philosophy theories for disease into one disease classification system or nosology. This was how he interpreted diseases to be based upon the best of what he could learn at the time, the early to mid 1800s. In 1850, the physicians were leaning towards believing in the complex nature of the human body, and its many parts of which we know very little overall. These thought contrasted with doctors who converted their philosophy from that which focused on one major condition at a time, now being considered a symptom, to a philosophy which looked at these couple of symptoms or more as indicators on how best to treat the patient. Both allopathic medicine and homeopathic medicine during these years (about 1845 to 1860 to be more exact), overlapped greatly in their diagnostic and treatment activities. In fact, it wasn’t a surprise at this time to find symptoms ruling as the means to define the cure for a patient, with allopathic or regular medicine stating one way to treat a disease, basing its methods of the toxicity of certain minerals, plants and other medicines, whereas the countering homeopathic idea on how to cure a condition took the logic already adhered to with the vaccination process, and applying it to the selection of medicines for effecting a cure. Like the founder of homeopathy Samuel Hahnemann believed in, very small amounts of a substance were all that was necessary to trigger a curing or treatment response whenever an illness was close by, or about to take hold of the human body recently exposed to it. Hahnemann’s remedies in theory duplicated the signs and symptoms of an illness enough to cause the body to strengthen its defenses and adapt to these stresses, a behavior very much evolution-based in concept and Lamarckian in terms of the bulk of its philosophical explanations. In just a few years, Charles Darwin’s views of evolution and selection would take center stage, removing these Lamarckian concepts of adaptation and the development of stronger generations by environment-induced anatomical-physiological change from many parts of the medical philosophies that depended so much on Lamarck’s way of defining things. Another part of the German history that influenced this work, and made it different from the American and British writings trying to review much the same sorts of philosophies, was the tendency for German writings to converge concepts together into a single word and a single sense of things in nature. The nature of English based scientific terminology tends to exclude holistic concepts from an idea or the gestalt of the idea in mind. To us a book is a book, to them it is more than just the sum of its parts, it has a story to tell. Much later, an extensive amount of criticisms would erupt about this behavior by physicians, in particular once the regular doctors came to a better anatomical, physiological, and microscopic understanding of how the body works and the different ways that becoming ill relates to the construct of the human body, its parts as well as its whole. These arguments about the cause for disease and disease theories during the early 1800s also had the issue of understanding the smallest parts of the body, versus the focus on how the body presents and the symptoms it has for particular diseases. The holistic view of the body became less important in some parts of the field as physicians learned more about the make up of the body’s parts, its organs and tissues. This changed the body into something that had a lot of details that needed to be learned to practice medicine, and although this change in view of the body to some seemed no different that the century before when the newest anatomists, chemists and other specialists of medicine compared themselves with Sydenhamists and the like focused on who the body presents, most externally, in terms of how ill it might be, much like physicians did throughout the second half of the eighteenth century. By 1850, there was a split in the medical field arising from this change in thoughts as homeopathy began to separate from allopathy. Homeopathy maintained the beliefs that symptoms were the most important part of learning and understanding a disease. For this reason, the focus of homeopathic care was on just the symptoms of the body, not the nature of the problem as it is revealed underneath the magnifying lens or microscope. Even regular doctors clung to this belief system during the first half of the 19th century, but by the time 1850 was reached had come to the realization that symptoms alone was not the best way to understand a body’s ailments. But this dependency on symptoms was largely responsible for how diseases were being classified for the time. In 1850 much like in 1800, the single most important symptom used to classify disease theories was the fever. Due to more than a century of observations on fevers globally, a fairly useful way of differentiating them based on the fever behaviors became popular. Seasons, cyclicity and patterns of the fevers helped define their relationships to each other. The fact that certain patterns appeared to be linked to certain geographic features only helped to strengthen this philosophy about them. For every cause for disease that is published, like the germ theory, the bacterial theory, the virus theory, there are many other causes also being argued about the same time. Not all diseases today are just bacterial and viral in nature, nor are they just immunologic in nature, or just a result of exposure to sunlight, or excess chemicals in our food, or unnecessary amounts of radon in our basement. The complex nature of diseases and how they are created in our bodies define the sciences of pathology–the study of causes for disease at some physiological level–and etiology–the actual study of simply cause and effect. But these in turn are part of the knowledge base we use to form the classification tree for diseases, which today is the International Classification of Diseases [ICD] system. Back then the commonly published, much simpler nosology outlines were very much comparable in nature, theory, and even philosophy. The purpose of these classifications system in human thinking goes back to Linnaeus and his predecessors devoted to designing classification systems. We needed to know how to make sense of everything, assigned each thing a value and a name, and try to correlate things that seemed closely related to one another. With physical objects such as plants and animals, rocks, water formation and starts, this all seemed pretty easy to develop our logical perspectives for. But for some less obvious grouping of things in the world, such as human behaviors, human ideology or philosophy, the way our body works and especially how it becomes dysfunction in some way, shape or form, the design of a nosological system to define these working relationships between things and their changes, effects or consequences became very much a philosophical venture, if nothing more. Even today, the way we relate diseases to each other is completely driven by human observations and subjectivity. The logic we use to divide diseases into groups is completely cultural in nature, not at all the result of pure science. It is conjectural, physically driven more than metaphysical, opinionated and at times so strongly opinionated that it appears cultural in nature. The reason other countries don’t have some of the diseases we have in our ICD system is that they are simply snot us, or believe in the same things we believe in, ‘we’ meaning those who adhere to the contemporary taxonomy for diseases used to make and classify our diagnoses. Canstatt’s nosology, based almost completely on the geographic and physiographic interpretation for diseases known as the time, is a model for classifying diseases that is helpful for medical geographers to understand. Today’s environmental sciences and health follow many of these same ideologies, but take them a long a more scientific path. Yesterday’s miasma of the calcareous rock beds is today’s alkaline rich water infested with only certain microorganisms due to its pH and karst-water geography. Whereas in yesteryears such a geology made it easy for certain forms of diarrhea to set in and certain forms of gases to form in the crevasses and broad openings formed in the substratum to form asthma and the like, today we relate diseases over such a region to the temperatures and humidity in these karst-generated caverns, enabling certain protozoans or fungal organisms to be raised and dispersed as spores in the air above these formations, resulting in mineral waters induced purging experiences and certain hypersensitivity induced lung conditions. How we break diseases down into different categories all depends upon how we view the relationships of diseases, people and natural events to each other. By breaking down diseases into such a detailed branching tree of ideas or professional opinions on how to classify them, we unknowing allow subjectivity to define the way we interpret illness and the individuals diagnosed with such a condition. We assign cause to that person, or to his/her surroundings based on this ideology, and we define our treatments for the individual based on it. We also define the ways to prevent such a condition from developing by applying this philosophy to the overall synopsis of that person’s living habits. Whereas today we say to some stop smoking, change your diet, move to where there is less pollen and humidity, engage in aggressive outdoor sports, back then the physicians recommended such things as improving the ventilation in your house, partake in foods produced using more locally grown plants and wild animals, move to where the latitude and local climate makes the climate more appropriate for your body and lungs, engage in recreational outdoor activities like horseback riding, walking and even engaging in the German style of gymnastics therapy. The cultural and physical geography thinking of back then, still exists today, with the only difference being how much we have broken the microcosm down into small pieces or elements. There are still ways to argue that passing comets (the cause for viruses perhaps), meteors (their dust in the air and viruses), planetary alignment (the length of day and how certain weather and amount of sunlight patterns per year create depression in certain parts of the world), gases and the like emitted from the earth (methane and radon), local earthquakes and volcanic activities (stress and fear), weather (too much humidity spoiling the fresh, clean air), smelly water (rich in uranium, chemicals and the stench of decaying bodies, sulphur and other salts) can all play into how we become ill, or believe we are becoming ill. Even as we try to fill in the blanks at times between observations and the related theories we use to define what to observe, we often wind up being wrong with our theories on the cause-effect relationships we believe exist. In terms of theory, the most objective part of this research–making the initial observations–is for the most part pretty much unfaltering but due to opinions generated from these observations, the conclusions that lead us to draw can be quite fascinating. Canstatt’s way of linking all of the natural elements together into a single nosology, focusing on geography as the means define the causes for disease, is what is being presented here. He pulled the macrocosm and microcosm of nature together, as he knew them to be, in order to define his interpretation of the natural causes for disease. Dr. Canstatt’s theories for the causes of disease are a good example of the subjectivity that exists in medicine, with regard to defining the unknown, like the roots of all diseases, their etiologies and pathologies. This was in line with the time when another theory was just becoming popular–the zymotic theory. For a generation or two, these two philosophies existed together in medicine, just as the bacterial theory and zymotic theory would do about 50 years later. The following is from the introduction to Handbuch der medicinischen Klinik. . . (1847) by Dr. Carl Friedrich Canstatt (available at Google Books; links are above, beneath the title for this page). With this translation we see how the German interpretation of natural philosophy explains how such a tradition developed and impacted much of the medical world during the 1850s and early 1860s. The reasons for focusing on German philosophy are several. First, this European tradition resulted in the first mapping of diseases as regionally distributed global phenomena dependent upon latitude, longitude, the amount and intensity of heat and solar activity. , along with temperatures and humidity, for example the very first world map of disease produced by Heinrich Berghaus, followed by the second and third such maps produced by Adolph Muhry of the German professional community, and Alexander Keith Johnston of the Anglican community. Second, unlike British scientists and philosophers, German scientists and philosophers had the ability to merge words with different meanings into a single concept. These compounded words often resulted in concepts such as Landschaft-the gestalt of land and its form, meaning and use, Excretionsstoffe — (stuff that is excreted – – fill in the blanks), “der Humoral und Solidarpathologie” — leftovers of the traditional colonial humoural theory and William Cullen’s solids theory popular back in the 1780s, 1790s and even early 1800s, Blutbestandtheile – blood’s natural form or substance interpreted for the time, Krankheitsprocesse – a natural history take on pathogenesis, and Individualitätskrankheiten — those very unique one-of-a-kind cases that only one or a few people can ever have due to their unique heritage and psychology. These German concepts respected the microcosm as much as the macrocosm of earth and disease, a philosophical concept sometimes lacking from the mostly microcosmic approach taken by other western European scientists trying to better understand the chemistry and physiology of health. In the following pages from a German text on geographic medicine, , we find the evidence for this logic in defining disease patterns now reaching its peak in certain professional settings. For this display, the original German text is in grey, with the translation and its variants in blue; those words that were composites or disease/combined symptoms names that were harder to define weren’t retained in their original form. There has always been a certain crudeness for the practices engaged in by empiricist veterans, who were overly anxious to dissect the concrete cause of an illness on down to its physiological relations and to speak figuratively, penetrating just the outer surface of the focus for this conversation. They were happy when they were the young children in this profession, easily identifying the external characteristics of a disease to which they give a name, with which they could thereby define its required medical treatment. The glory of this practice as an art was also taken for granted by these empiricists, the number of whom never seemed to be exhausted; but there were always those the doctors who had to do better, by comparing the external symptoms with the inner body. This interest in pathological anatomy is not a new-born child of our day, and it would be ungrateful if we forgot the overweening confidence its recent acquisitions have had, such as the interest in knowledge made by Bonet, Morgagni and others Scholars that supercede other much earlier, more outdated writings. One should want to take the abstract concept of that which we today call disease and relate it to the expression of one’s own self existence, one’s self-contained being, living as a healthy organism put together in association with its own laws of life or being (the ens); [this is] a popular belief to many, [one] with a loud uplifting voice of Reformists in this profession who use it to partly or fully express their rights to believe in such a view. I fear, however, due to their fear of taking on this ontological way of looking at risk, that they are throwing out the baby with the bathwater, along with the special pathology [that is] so close to this way of thinking, concealing it completely in order to allow for more space to be filled in some other semiotical way. Specific diseases are identical to the special pathology they have, or have symptoms that may get lost if a fragmented perception of these individual conditions were to develop. Therefore, we must ask the question whether to a certain degree, are Symptoms Complexes (“Symptomencomplexe”) signs of the cause for disease, or are they the disease itself? This corresponds to whether the nature of the disease is that which is or can be deduced from a hospital medical interpretation of the patient. We generally do not explain the general meaning of the term pathological disease. Suffice it to say that any kind of deviation from that type of approach based on pathology in which one recognizes health, is generally not applied to disease. All life is manifested in the expressions of life we make. From the diversity of the expressions of life it can be seen how far our functions represent a type of healthy living faithfully and relate this to our knowledge of the Symptoms Complex, determining how different the two routes are once the two routes collide to form one, with one route leading from the inside of the body to the outside, and the other from the outside to the inside. This is the second empirical theory of health– both of these routes complement each other and form the roots of the tree of the knowledge of disease. Thus the investigation of the disease is twofold in terms of the object of observations. First, initiate and maintain your treatment for reasons related to the morbid material or function that is totally changing within the organism, and as a result, the healing of organic abnormality ensues. [Second,] the disease must then also be examined for its genetic and other formal reasons or relationships. Changes in the organic matter, deviations from health functionality utters to us in the form of the types of lives we live formally once we are ill. A certain volume or size of organ is typical for good behavior. If the diet (or expectation) of an organ changes so that that its typical use falls or lessens, from this arises functional disturbances which affect a balanced healthy life, and a disease where formally a unilateral mass reproduction occurs or a mass reduction of the organ prevails, consequently disturbing the rest of the entire body. This we call the hypertrophy or atrophy of that organ in a disease form. With such a disease form we therefore understand that a deviant material change of parts of our organs occur, with the implication that a change in the consequent presentation of the expressions of life will ensues the sum of which is less than those defined by the laws of life. Thereby this results in phenomena of organic matter and changes in activity which then present as a single complex of symptoms. What comes from these [disease] phenomena in the eyes of the physician is the material with which he recognizes the formal form of the disease and the patient’s healing. The individual parts of this complex morbid phenomena define the [total] form of the disease, nothing missing, but also not fully observable, only that which is mostly externally perceptible and what is an incomplete picture of the whole. The resulting shortcomings of a diagnosis made based on this method may simply be a humble expression of disease just as something which is externally knowable. In the least, it provides us with a description in words and so we are happy, and write that name down until you learn better about it. But knowing the special pathology of a disease initially [also] has the task of representing the disease from its formal side or form, to be put into perspective with the manifestations of life and by any interventions experienced by the diseased organism itself. The physiology of the healthy body is also that of the sick, in other words, the journeyman of life (force that keeps us alive) remains equally placed between a state of health and disease; that which is called the health disorder, the disturbance of the normal type of life, is only achieved through a hostile relationship between the outer life charms (forces) and the individuality of the sickening, characterized by a standard beyond that which brings about changes due to the type of organic matter falling, which now is in part under the control of the physiological laws of the body and interacts with them and changes the previously normal, healthy body . This is not the result of immutable calculations of many targeted objects, but a result of only one calculation in which one exponent is changed. From the forms of healthy living come the laws of the sick. Such is the object of the general pathology, or, as they liked to call them recently, the physiology of the disease, such an attempt teaches us that the manifestations of the disease attributed to the physiological states and functions can be used to distinguish the general types of forms of disease which exist, without being due to something new, but due to making the healthy form of body different, regardless the same physiological laws for life that must be obeyed. The above paragraph is a human ecology take on the natural philosophy of things. Man is no longer part of a pastoral site with life and health handed over to him so long as he behaves. God is absent so nature defines his fate. These general forms of the disease, [which] I have called elementary forms of the disease, are either changes in form or shape including hypertrophy, atrophy, hyperemia and stasis (inflammation) and their possible product formation, [such as] hardening, softening, suppuration, bleeding, dropsy, anomalous secretions, pneumatos, heteroplasty (change in form), [and] in some cases also changes the juices – or [are] due to abnormal functions that present as nervous system manifestations [and] neuroses. Every form of disease as it appears now, in which a certain number of appearances occur according to institutional requirements, probably requires no further proof of its identity. The symptom complex forms the basis for the diagnosis of a disease, its specific seat [in the body] and its course. In these cases there no danger of falling into an ontological fantasy. It (these fantasies) only threatens us with danger if the diagnostician constructs an incomplete diagnosis from an incomplete set of observations, and is allowed to present his conclusion about the sum of these phenomena, as he knows it, without recognizing truthfully and with humility the limits of his knowledge and how he constructed his conclusion on his own. We are able to give physiological reasons that can be used to define the theoretical Complex of symptoms expressed, which are expected to define changes of the organic matter that exist. This infers to us the mode of disease and the theoretical way we must further explore it. We also found by experience and observation, the value of the self-assembling formation of diseases manifesting as groups, deriving empirically the most appropriate way to define these as a disease symptom complex. The knowledge gained in this way is always most important, and only through its initial construction process can it be corrected. Consider the most obvious symptoms of a disease form or presentation by its external parts, for example, a simple edema of a roth (red mark) over a boil, a comedo, or a wart formed due to a teleangiectasie thereby distinguishing it from the rest. It is so difficult to diagnose this disease because it usually forms in the inner, hidden parts beneath its surface. By remaining sick more or less with it, the symptoms its produce mask other observations, so that doctors are only given an incomplete view of what this disease really is. In this case, it is then left only to the practice of divination to determine the real cause, which has also been practiced by some really famous diagnosticians. Without true science, nothing is gained here. Therefore, the honest doctor learns all too often that his knowledge has been piecemeal and that he must sadly confess that some knowledge was denied him, and that in certain cases, beyond individual symptoms, he needs to develop a fuller knowledge of the health and forms of healing that rest beneath. This is part of the nature of things. Defects of nature bring about great strains on the power of observation, causing us to require extreme accuracy, such that even under unfortunate circumstances we will reach the best results that are humanly possible. Such is the true art of the diagnostician. If you want to condemn those physicians as Ontologisten, doctors that are quick to make decisions based on an unrelated pair of symptoms which together form a disease to them, the name of which it does not match or justify such a diagnosis physiologically, so be it, we do not mind. We have no way to express an apology for this. Through the knowledge of the causes which have brought about the current as pathological changes, we gain an understanding of the whole process. Due to the diversity of causal factors influencing the variety of the effects of these changes in the organic matter, these changes are not limited. I have already remarked that for the study of the origin of each form of the disease, there is a genetic side of importance of knowledge that must be pursued regarding how the two complement each other. I draw special attention to this for of etiology everywhere in this work. The relation of this last class of medical healing and how it causes the disease is unique. The heat generated by the noxious agent or change in organic matter must still abide by the general physiological laws of life. But the harmful agent itself often has a degree of independence, which does not undergo a matching influence by the organism to reason; according to its own laws, this indwelling causative agent is only received for a short time, during which it survives and then eventually disappears after a certain duration. It most clearly occurs as a result of substance generated by miasma, or for contagion diseases of a parasitic nature with a causative agent that can not be ignore; the same can be produced by germs that the organism receives and incorporates into the body. This agent avenges the body in a fixed form during a certain period of time, and then passes through different stages of development in the blood, multiplies and produces new seeds, which are then transferred to other organisms that go through the same process again. There still remain a number of diseases found that have no place in the previously considered Classes. They have [often] been described under the names of chronic dyscrasia, constitutional, lndividualitätskrankheiten, depending on whether its cause is proximate in a particular abnormal Krasis of blood, or from the differing nature of normal solid parts so as to change the normal Constitution. Peculiar to them is [the fact] that they are usually slow and gradual to develop, not [such] as is caused by a blow by harmful acts, they are rooted often in congenital feeble constitution, and very often are due to the predicate of heredity, thus their close connection with the original Constitution and their given constitutional name, Individualitälskrankheiten. Even if they arose only later they merge so intimately with the individual that they are difficult to separate from it at the same amalgam [of that individual] and therefore most stubbornly resist any healing attempts, insofar as it does not succeed to convert the entire Constitution and improve. Many diseases of this class remain medicorum Scandala (objects of scandalous medical practices). The dyscrasias have chronic diseases that are naturally limited in their pathological changes and expressions outside the individual organ parts [in which they] occur; by wandering here and there about the body, consuming simultaneously or successively different parts [of the body], their [result is a] suffering revealed in the general Plastik, with predominant or alternating [signs and symptoms] concentration in this or that part. That often, though not always, a lesion of the blood due to the generally About the plastic is spread morbid mood, should not be doubted. The faulty Krasis of blood can be partly direct and partly proved by the nature of the Se-and Excreta [secretions and excretions] from the changes in the nutrition of the parts, the disease Producten. It must be admitted that these constitutional diseases can develop from small beginnings and a single site of the organism as an initial strictly local disease when it is disturbed, for example by constantly acting in their typical injurious course to spread [throughout the blood = allmäblig??? ], assume a chronic character and can [lessen = miniren???] the organism, it may also often only be the faulty Krasis, the juices that come into being due to the fact that the sick individual organ the blood or substances massed about (collected) escapes, or whose deficiency impairs the body and its normal composition, or that individual members of the sick, taken by these products of disease in the blood whose healthy mix of juices become clouded. Such are the stages of developmental for chronic dyscrasia, based upon their height and age, this morbid Krasis can of course become more pronounced. Also, we do not want to lose sight of the fact that here is a constant interaction between the liquid and solid parts of the body, or ignore these changes in the latter and their ability to cause chronic dyscrasias or effect the fluids. The dispute between the humoral and solid organs pathology (Solidarpathologie) [theory] must, therefore, always move in a vicious circle, [even] if you want to fixate on one side of the starting point of this disease class in the solid or liquid parts. [Example] the origins of the disease are now here, now there, and then in both at the same time while you’re looking, but later all the integral parts of the organism behave as such in this lesion or illness such that every split or change that happens appears violent and unnatural. If the blood confers the main role in dyscrasic processes so this happens because the blood, as the carrier of all assimilated substances (assimilirbaren) and all consumed organic matter, defining the whole plastic process that certainly ensues. Also quite often, the vehicle for disease agents or stimuli, are the means by which the dyscrasic localizations are determined and attended to, and finally the way they go out and precipitate diseases, often expressing materials before this happens. We believe we have not concealed any shortcomings of the teaching that this class of diseases of faulty Blutkrasis (blood roots or form) [give us]; it fits well with all other parts of the pathology [we presented], [and] we are in a period of transition and transformation; a fixed branch which does not allow whomever keeps the old science account to lag behind this perpetually progressive movement. He may not want to be a part of the provisional lowness these values give ​​to their older unchangeable ideology. [Those theories] without order, but with the scientific illustration of a doctrine that is not possible or indicative of a systematic process such as Classificationsprincips [Laws of Classification], or satisfying even as an example of a poor alphabetical list, are of limited essential service to science. There are similar thinking sophists–those who do not sin when they sleep. How wrong as well was their regularity princip [law], — it brings its benefits but offers room for criticism as well. Science wins not only because it discovers truths, but also because it corrects its errors. This interpretation that Canstatt provides is important to understanding British Medicine during the late 1850s, but especially the 1860s. 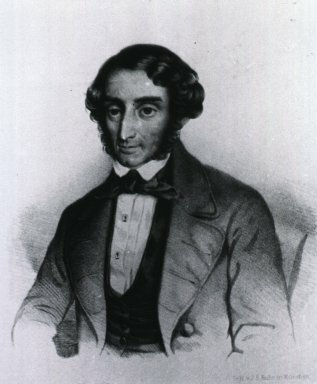 During the 1840s and early 1850s, British Medical Geographers worked hard to promote their own new theory for disease developed by William Farr — the zymotic theory. Canstatt’s taxonomy or nosology comes very close to Farr’s with his initial entry “Specifische exanthematische Krankheitsprocesse (Exanthematous, specific disease processes)” Canstatt’s exanthema are fairly equivalent with Farr’s “zyma”. By 1856, Alexander Keith Johnston was well read in the German interpretations of topographic disease causal theories, enabling him to produce his own version of this theory, pulling some of his map concepts from the other German medical geographer who produced the first global disease map of its kind about the same year Canstatt published this book. 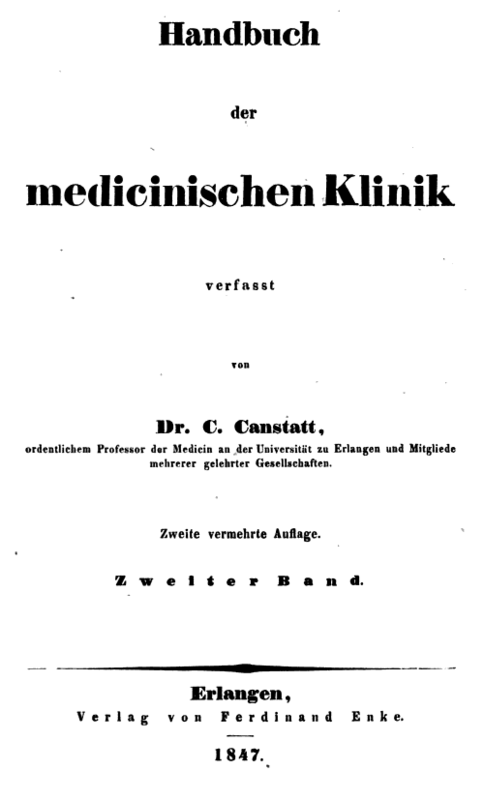 We know that Canstatt was strongly promoting his theory in this book due to its later reprinting as a second edition in 1856, one year prior to the publication of Johnston’s map and its counterpart for the year, the global disease mapping work and book on Medical Geography by yet another German medical geographer, Adolph Muhry. The influences of this work can best be seen by the later theories that prevailed in the late 1860s and 1870s with medical and disease geography. In particular, this last section of Canstatt’s book had a major influence on the future mapping and research of cancer in Great Britain. Some of the geological concepts about disease and substratum layers and their chemistry gave these new geographers a physical substance to attach causes to. The alkaline theory for disease of the 1760s had progressed through its early 1800s alkaline water based cause and prevention concepts for disease development found throughout the first decade of American medical magazine distribution, as well as the maturing of this philosophy that attempted to surface in the 1830s, as part of the explanation for the new cholera pandemics erupting worldwide, followed by similar events with cholera in the late 1840s and early 1850s. By 1854, although refuted by some of the best, most famous medical geography writers and epidemiologists for the time, this geological theory did have its value once it was applied to a disease other than Cholera, namely the large numbers of Cancer cases in of England. This left cholera to be defined as a result of environmental causes opposing those of the alkaline soil-water theory. The way this theory played out over the next 5o years is interesting. In British medical geographer Alfred Haviland’s work, esp. works published between 1870 and 1875, we find alkalinity once again to the be cause for disease, this time for the cancer cases just north of a coal field in England. About the same time, in Lawson’s work that was published on cholera and the cause for recurring epidemics, Telluric and Atmospheric causes for diseases were defined, a product of Canstatt’s tellurisch atmosphärische Miasmen (telluric atmospheric miasma) and Atmosphärilische Seuchen (Atmospheric Disease) proposals made 25 years earlier. Just a few years later, the bacterial cause for disease would be proven, and replace William Farr’s Zymotic Disease theory. Only a few relics of Canstatt’s existed during the late 1890s, Robert William Felkin’s map of Scurvy, and his Pandemic Map derived from Lawson’s work, providing the best examples.